Cook the Acini de Pepe pasta until tender, about 10 to 15 minutes, with a bit of oil in the water. Drain and chill. Combine sugar, flour and salt. Pour juice slowly into mixture and stir with a wire whip. Cook over moderate heat until slightly thickened. 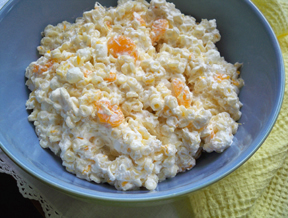 Stir a small amount of the hot mixture into eggs and then stir the egg mixture into the hot mixture. Cook and stir until thickened. Add lemon juice. Cool to room temperature. Combine with cooked pasta and mix lightly. Cover and set in refrigerator overnight. 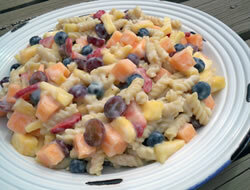 Next day, add the drained fruits and marshmallows to the pasta, mix lightly but thoroughly. 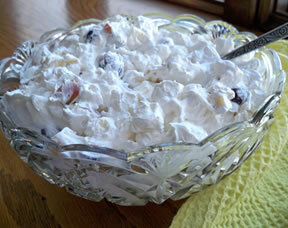 Whip cream to stiff peaks, fold into salad and chill until served. Serve at 40Â°. Yield: 50 servings, 4 ounces each.